Multimonitor support problems delay Canonical's X window replacement. Ubuntu 13.10 ("Saucy Salamander") is scheduled for a final release on Oct. 17, but the OS won't include what was perhaps the biggest and most controversial change planned for the desktop environment. Canonical announced in March that it would replace the X window system with Mir, a new display server that will eventually work across phones, tablets, and desktops. It has proven controversial, with Intel rejecting Ubuntu patchesbecause Canonical's development of Mir meant it stopped supporting Waylandas a replacement for X.
Mir will ship by default on Ubuntu Touch for phones (but not tablets) this month, allowing a crucial part of Ubuntu's mobile plans to go forward. However, it won't be the default system on the desktop, because XMir—an X11 compatibility layer for Mir—isn't yet able to properly support multi-monitor setups. This is a step back from Canonical's original plan to "Deliver Mir + XMir + Unity 7 on the [13.10] desktop for those cards that supported it, and fall back to X for those that don’t." "While we are on track to successfully deliver Mir for Ubuntu on smartphones, we are unfortunately not going to be able to deliver Mir + XMir + Unity 7 as the default experience on the desktop," Canonical executive Oliver Ries wrote yesterday . "Mir has made tremendous progress and is currently available on the Ubuntu archive for use, but there are still some outstanding quality issues that we want to resolve before we feel comfortable turning it on by default. Many of these issues live in the XMir part of the stack, which provides the integration between the X server and the underlying Mir system compositor. More specifically, the multi-monitor support in XMir is working, but not to the extent we’d like to see it for all of our users. The core of Mir is working reliably, but with XMir being a key component for our 13.10 goals, we didn’t want to compromise overall Ubuntu quality by shipping it." Users who want to install Mir and XMir anyway can get it from the Ubuntu archives as an optional configuration. 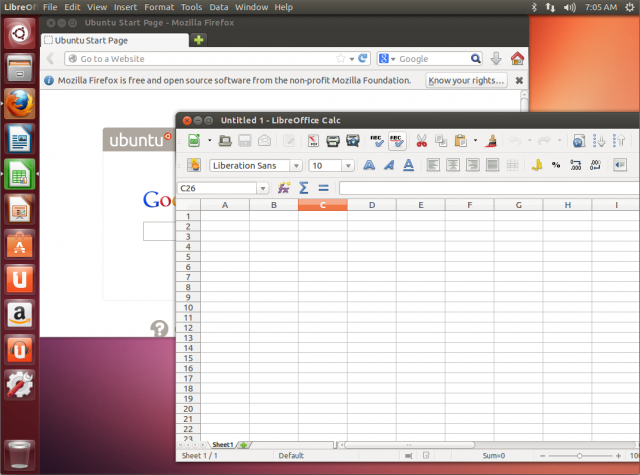 13.10 is the last release before 14.04, the next Long Term Support (LTS) edition of Ubuntu. Canonical generally doesn't implement giant changes in the LTS, instead focusing on making it stable for business use on desktops and servers.Canonical presumably still wants to make Mir the default in 14.04 to achieve its mobile/desktop convergence plans, since many users would likely stick with that version for two years until the next LTS edition arrives. Ries confirmed that in an e-mail to Ars, saying, "As of today we are still working towards getting XMir in shape for Ubuntu 14.04 LTS. However, as usual with an LTS release we are closely evaluating the quality status of the software as well as the ecosystem need for software that is being included in an LTS release. vUDS [Virtual Ubuntu Developer Summit] in November will be the next point in time where we will assess the situation." In an FAQ on the Ubuntu wiki , Canonical answers the question "Does this announcement mean that the Mir project has failed?" by saying, "Not at all. Mir has made significant progress, and has been built with a full CI (continuous integration) test suite, resulting in a reliable core, and a testament of this is Mir powering the Ubuntu for phones images. The only change is that we needed a little more time to assure the high quality our Ubuntu Desktop users expect, so we decided to do the right thing and not switch Mir on by default." Canonical is holding discussions with GPU manufacturers to ensure support for Mir. "[W]hile those conversations are under NDA, I can assure you they are progressing forward," Ries wrote. Some more detail is provided on the Mir roadmap page, which says, "Right now, Mir does not run on desktop hardware that requires closed source drivers. However, we are in contact with GPU vendors and are working closely together with them to support Mir and to distill a reusable and unified EGL-centric driver model that further eases display server development in general and keeps cross-platform use-cases in mind."